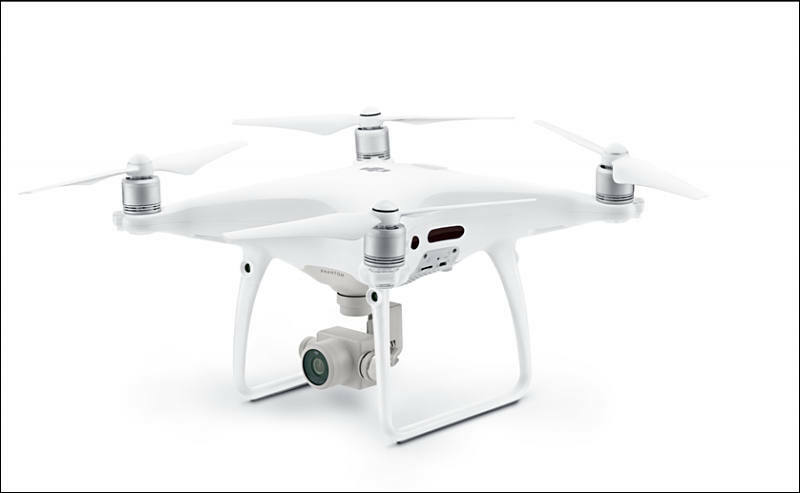 Phantom 4 Pro offers a powerful imaging system for professional photo and video creators as well as non-professionals who demand excellence from the camera and platform they use to pursue their creative visions. The camera now packs a 1-inch 20-megapixel sensor, and almost 12 stops of dynamic range bring out levels of detail and low-light performance unprecedented in a flying camera of this size. Its mechanical shutter eliminates rolling shutter distortion in fast-moving scenes. Phantom 4 Pro can capture slow-motion 4K video up to 60 fps at a maximum bitrate of 100 mbps. In addition, the Phantom 4 Pro offers H.265 video compression, which substantially improves video quality at the same bitrate. Phantom 4 Pro builds on DJI’s original obstacle avoidance system with FlightAutonomy – three sets of visual systems that build a 3D map of obstacles in front, behind and below the aircraft, as well as infrared sensing systems on both sides. FlightAutonomy can position, navigate and plan routes for Phantom 4 Pro, enabling it to avoid obstacles in a sensing range up to 98 feet at front and rear, even in complex 3D environments. When returning to home and tapping to initiate auto takeoff or landing, the Landing Protection function is able to detect and help avoid landing on uneven ground or water. Phantom 4 Pro has high-performance battery technology that provides up to 30 minutes of flight time. The Phantom 4 Pro flies at 31 mph in P mode with obstacle avoidance in effect, and has a 45 mph top speed in sport mode. Phantom 4 Pro’s revolutionary new compact remote controller comes with an optional high luminance display, providing a clear and vivid live HD view from the main camera as well as essential telemetry data, even in direct sunlight. The aircraft will automatically choose between 2.4GHz and 5.8GHz once powering on to gain a clear signal in areas with high radio interference. The new controller has a built-in GPS, compass, Micro-SD card slot and HDMI port. New intelligent flight modes make Phantom 4 Pro the smartest flying camera of its size, opening new vistas for creators, such as the new Draw Mode that allows operators to draw lines on the controller display and direct the Phantom 4 Pro to fly that route. ActiveTrack recognizes common subjects such as people and bikes, then follows them from any angle while maintaining camera focus, and includes three new modes – New Circle, Profile and Spotlight. Narrow sensing enhances obstacle avoidance sensitivity so the aircraft can fly through complex environments like narrow doorways. TapFly now works backwards and comes with a new Free mode that allows a pilot to set the direction of flight, turn the Phantom 4 Pro or tilt the gimbal without changing the direction of flight. With the new AR Route feature, operators will be able to tell the flight route on the screen. As an additional safety feature, within a minute of losing GPS signal, the aircraft will automatically return to the last connected position and hover there precisely to wait for the pilot’s command. With the enhanced return to home function, the aircraft knows where it should be going from up to 984 feet away and avoids obstacles along the route. Phantom 4 Pro’s U.S. retail price is $1,499 with a standard controller. The Phantom 4 Pro, which includes a Phantom 4 Pro aircraft, and a high luminance display remote controller, will be available at $1,799. Phantom 4 Pro and Phantom 4 Pro are immediately available for pre-order at dji.com/phantom-4-pro and DJI flagship stores in Shenzhen, Seoul and Hong Kong. These products will begin shipping one week after launch. So we finally get a 1" sensor, adjustable aperture and HEVC. Awesome! Not sure if the HEVC mode captures 10 bit however. I am pretty shocked how fast they move. I did not like the heavy moiré of DJI's cameras, the footage of the Phantom 3 was pretty unacceptable for my eyes. But if they keep up with this pace, man, they roll over the hole camera industry. I still fly a Phantom one with a gopro and a two axis gimbal, but this may change now. Hopefully the sensor produces a nice oversampled clean Image without any moiré and hopefully 100 mbps HEVC D-log is gradeable without getting these heavy artefacts. If the codec does not brake, this is truley a milestone in amateur cinematography. Let's sit and hope. Main reason why Japanese companies dominated is complexity of mechanical heavy DSLR cameras. As soon as you remove flash, mechanical shutter, wheels, prism or EVF and lot of complex buttons - many companies will be able to do it. @vitaliy: sure! But why the big boys exclude it, if it is that simple? Why Do we have to wait 2 years after the nx1 for hevc and the first Company is DJI? Why is it the First Company to let us choose the Codec? Why Do the other big fat companies let us be so hungry for improvements? Big companies can't move fast. As someone big will be upset, another will loose his face, etc. Lots of trouble. Development of LSI requires around 2 years, sometimes up to 4. Same for cameras as whole. Haha, It would be the First machine to have a 120 fps mechanical shutter. There are some youtubers, who think ist is also for Video. Man, are they sweet. It is something different from leaf shutter. Can be for video as they mentioned rolling shutter. Rolling shutter exists also in the photo world, it leads to distorted photos. No digital camera in the world has such a fast mechanical shutter for video. High-end mechanical shutters top at 20, maybe 30 fps and are costly. Trust me, it will have a mechanical shutter for photos. Nevermind, nobody is perfect. Nor am i. By the way, even mechanical shutter can lead to rolling shutter. A rotary shutter used in analog film cameras also leads to rolling shutter. Just some samples while trying to learn / test all the setting. Anybody know how the P4Pro handles 60fps vs 30fps regarding the bitrate? Both get 100mbps which theoretically would mean that 60fps played back at 30fps (slow motion) would get twice as little megabits per second since it needs to pack 60 frames into the 100mbits instead of 30.
which theoretically would mean that 60fps played back at 30fps (slow motion) would get twice as little megabits per second since it needs to pack 60 frames into the 100mbits instead of 30. It is on drone, so everything moves quite predictable and slow, interframe compression on 60fps is more efficient and require less bitrate. The iconic Phantom 4 Pro drone which made professional aerial imaging easier for everyone is back with a new professional appearance; a sleek matte-gray Obsidian colour shell featuring a magnesium, electroplated and anti-fingerprint coated gimbal which requires a higher standard manufacturing technique. For professionals who demand excellence while capturing images and video for a commercial client or documenting a wedding, the Phantom 4 Pro Obsidian has a large 1” CMOS sensor and a 4K 60fps recording capability to ensure a professional outcome in any situation. The Phantom 4 Pro Obsidian offers intelligent performance and a powerful imaging system for any serious drone photographer. With a retail price of 1,119 GBP (1,299 EUR), the Mavic Pro Platinum is available for pre-order immediately at store.dji.com and will begin shipping in September. The Mavic Pro Fly More Combo will be available at a later date with a retail price of 1,459 GBP (1,599 EUR). Phantom 4 Pro Obsidian will retail for 1,589 GBP (1,699 EUR) and will also be available in September at store.dji.com and at DJI Flagship Stores and authorized dealers worldwide.